How do I sell tickets using PayPal? EventNook provides the payment option with PayPal online payment gateway to sell tickets online for your event. With PayPal, ticket buyers can pay with major Credit/Debit cards or with their PayPal account. To accept payment with PayPal, you need an active PayPal premier or business account. When you create an event, you can choose PayPal payment option under Currency & Payment section. You will be prompted to enter your PayPal Login ID (Merchant ID) to collect payment from your ticket buyers. Your PayPal account will directly receive the payment from the ticket buyer, whenever there is a ticket sales. Here is a screenshot of how you easily can set up to sell ticket with PayPal payment option. 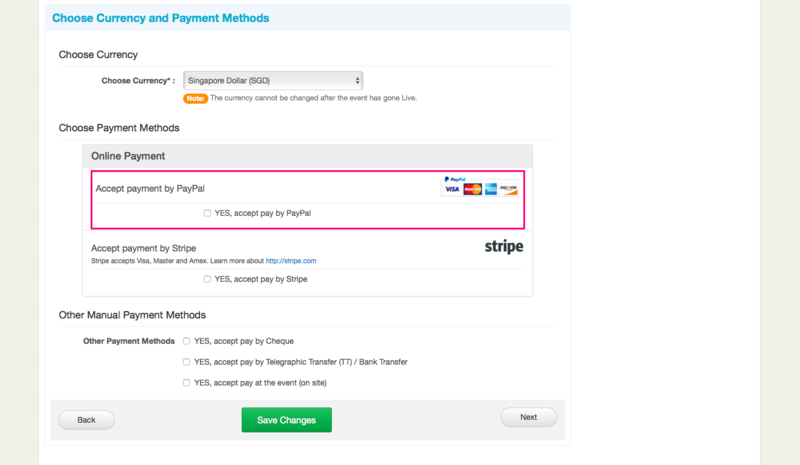 Note: For transactions from Singapore, PayPal charges 3.9% + SGD$0.50 per transaction on top of EventNook charges (Overseas charges differ). To learn more about PayPal charges, click here to find out.